The Antique Batik of Tjoa’s written Batik 3 negeri comes from Solo Jawa Tengah, for batik lovers will need to have recognized Tjoa’s batik. tjoa grouped loved ones is batik artisan that’s so popular previously to the present. 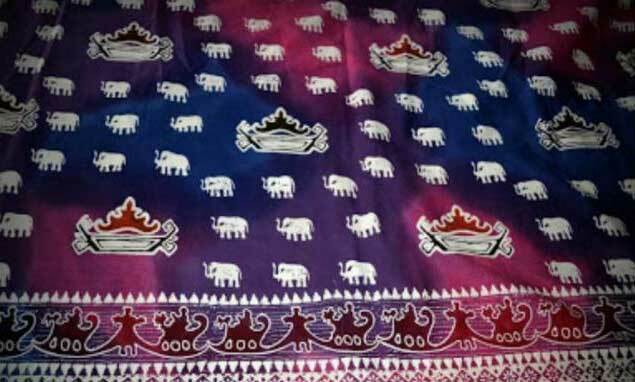 Batik is classified because antique in today’s and has the worthiness of art The type of batik 3 negeri has a variety and complex, filled with a diverse background. The complexity of design that takes a long time and a long process is the handmade that time-tested, resulting in a piece of dazzling fabrics. In addition to the family of Tjoa, Solo, batik 3 negeri can be found in north coast of Java in particular like Cirebon, Pekalongan, Semarang, Batang, Lasem, eastern Java island with a diverse motif. just like to do batik fabric process in 3 different place to make this batik in 3 cities such as, Solo, Pekalongan and Lasem. 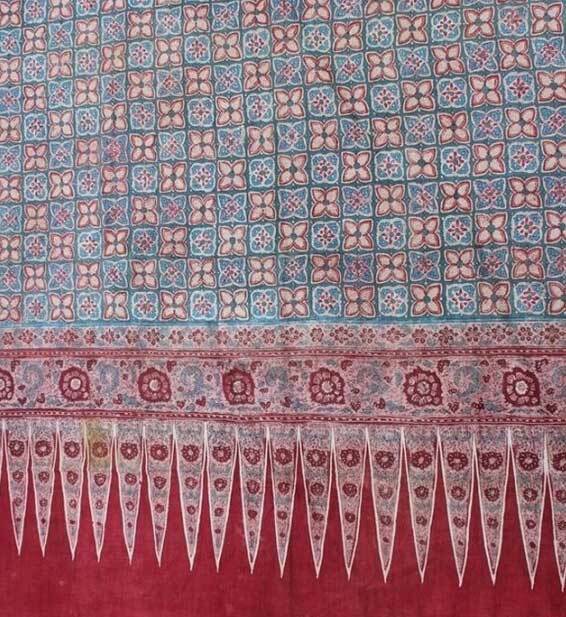 Based on its history, the other uniqueness of this batik lies from its colouring, that is in 3 different places / locations. If you think about it, why? … must be in 3 different locations, is not it a waste of time, cost and labor. It turns out that the uniqueness of 3 native batik is located on the element of colouring, the three countries in question is not necessarily exploring out of the country but 3 different cities in Java namely Solo (Surakarta), Lasem (Rembang) and Pekalongan. distance each place and the other is very far , can be imagined in the past they have to travel so long and far to the fabric of the 3 city of Central Java as a province formed since the time of the Dutch East Indies. Until 1905, Central Java includes 5 places (gewesten) namely Semarang, Rembang, Kedu, Banyumas, and Pekalongan. Surakarta continues to be a self-ruled swapraja kingdom (vorstenland) and includes two regions, Mangkunegaran and surakarta, along with Yogyakarta. Each gewest includes districts. In those days Rembang Gewest included the Regentschap of Tuban and Bojonegoro also. Following the enactment of the Decentralisatie Besluit in 1905, gewesten was given autonomy and founded the Regional Council. Additionally it is established gemeente (municipality) are usually autonomous, pekalongan namely, Tegal, Semarang, Salatiga, and Magelang. start from 1930 years, the province of central java has planned being an regional autonomy that includes a Provinciale Raad also. Provinces contain several residences (residentie), such as several regentschaps, and so are subdivided into several districts. Main Java Province includes 5 residencies, namely: Pekalongan, Jepara-Rembang, Semarang, Banyumas, and Kedu. Batik lampung appears because the idea of one of the old Javanese population settled in the region of lampung i.e. Gatot Kartiko with creative ideas to develop the pattern or motifs from traditional woven fabric filters fabric namely lampung and siger. Development of batik lampung quite rapidly when it began to be worn by former gubernut father Sjachroedin Z.P. lampung meaning and philosophynot as in lampung batik batik of Java in General, more to thewealth of motifs that demonstrate lampung identity itself. If reviewed from the point of history, does not demonstrate lampung facts of history that mengurucut to a culture here in the past, so batik lampung there because developed on the basis of the business that accentuate the characteristic area of the city of lampung itself as well as on batik jember created due to business factors combined with the characteristic of the city. Batik lampung more popular when worn by the former President of INDONESIAwho so love the batik indonesia Mr. Susilo Bambang Yudhoyono. Variety of batik lampung if review of the manufacturing process, there are 3 types of batik, handwriting batik(batik tulis), stamped batik (batik cap), and batik with motif full of lampung. The price of a piece of batik cloth this float is similar to batik prices generally range from IDR 75000 range up to a million more, depending on the type of fabric batik itself. Batik is one of the genuine wealth of Indonesia that is not owned by any other country. 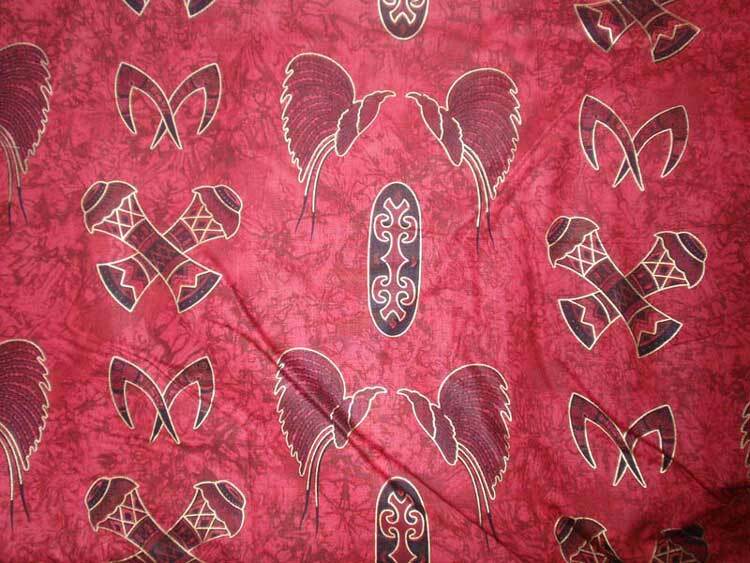 UNESCO has also even batik fabrics as one of world cultural heritage of Indonesia origin. In Indonesia alone, there are so many motifs that are scattered in various areas in the country. And each has a different motif. Of course the types of batik familiar in the ears of society is derived from Pekalongan batik, Solo, Yogyakarta, Banyumas and Cirebon. Most societies assume only areas on the island of Java alone that has the characteristic batik. 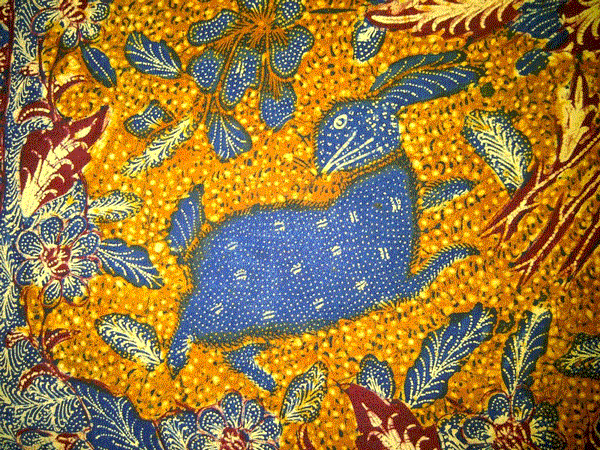 It turns out not so, many other areas in Indonesia which also has its own type of batik. One is a batik Papua. 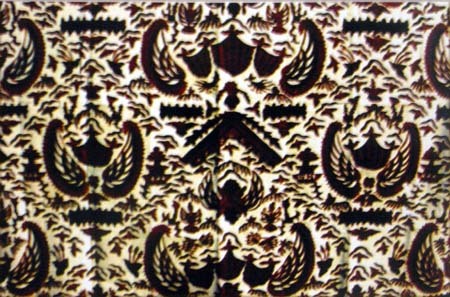 The uniqueness of the motif batik Papua is not synonymous with batik motifs of Javanese origin. 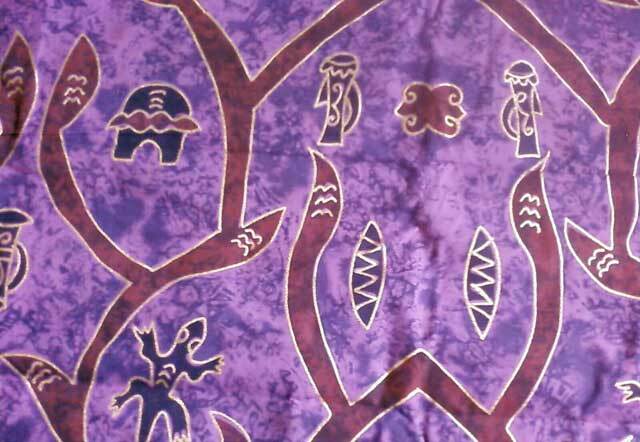 Batik motif on Papua more telling about the history in the past. 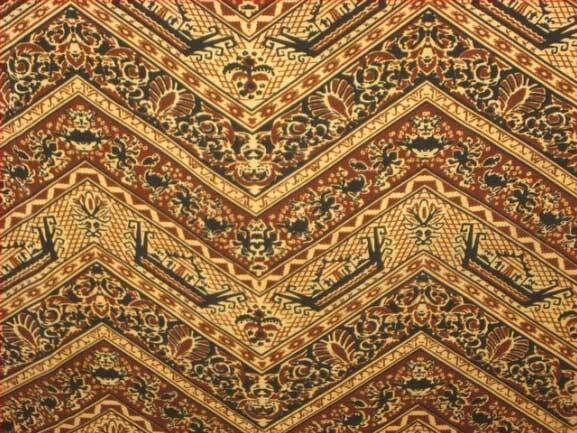 Motifs in batik cloth Papua inspired from paintings on the walls of caves, fossil, artifacts and other objects ancient relics that have a very high historical value. 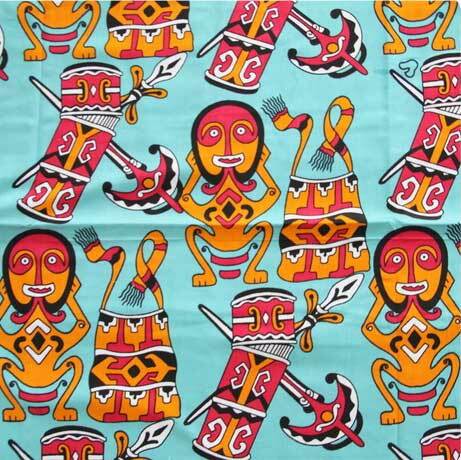 The creative hands of craftsmen in New Guinea, with a motif of batik batik called Papua. Batik is one of the genuine wealth of Indonesia that is not owned by any other country. 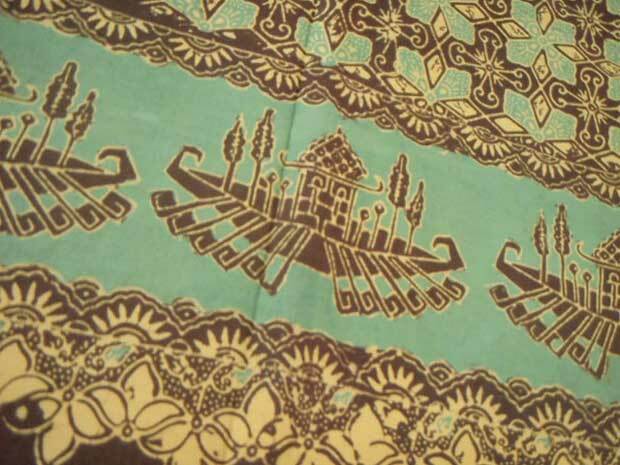 UNESCO has also even batik as one of world cultural heritage of Indonesia origin. In Indonesia alone, there are so many motifs that are scattered in various areas in the country. And each has a different motif. Of course the types of batik fabrics familiar in the ears of society is derived from Pekalongan batik, Solo, Yogyakarta, Banyumas and Cirebon. Most societies assume only areas on the island of Java alone that has the characteristic batik. It turns out not so, many other areas in Indonesia which also has its own type of batik. One is a batik Papua. 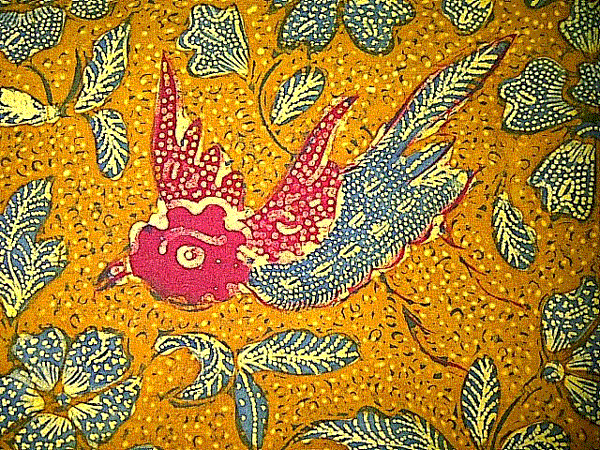 • batik motif of paradise bird (cendrawasih Bird), bird-filled with pictures of the bird. Wisdom became the core of the philosophy of nitik motif batik karawitan. Thus, the wearer will hopefully be wise. That is why elderly people in its surroundings many use this motif batik. Batik Motif gurda also did not escape the past belief. Garuda is a mount of Lord Vishnu is known as the Sun God. Garuda became a mount of Lord Vishnu and serve as a symbol of the Sun. By Javanese, garuda as symbols of life as well as a symbol of virility. The word is derived from the mountain meruMahameru. The mountain is considered to be the place of residence or the throne for the Tri Murti, namely Sang Hyang Vishnu, Brahma, and Sang Hyang Sang Hyang Shiva. Tri Murti is denoted as the source of all life, prosperity, and any source source of happiness to live in the world. Therefore, the meru used as motifs so that the wearer is always getting prosperity and happiness. 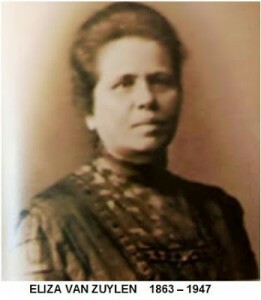 Eliza van Zuylen is is one of maestro batik in Indonesia, a Netherlands citizen who lived between 1863-1947. Here is one picture of Eliza van Zuylen batik work. 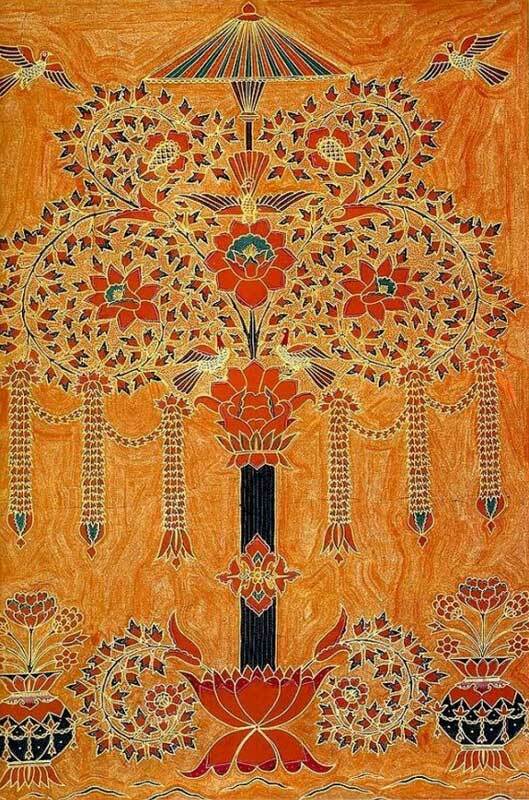 Batik works of Eliza van Zuylen are mostly patterned floral bouquet, which was later widely known as Van Zuylen Bouquet. Batik Netherlands began to develop between the years 1840-1940, in general the batik cloths Netherlands holsters that are just made for The Netherlands Netherlands descendants &. 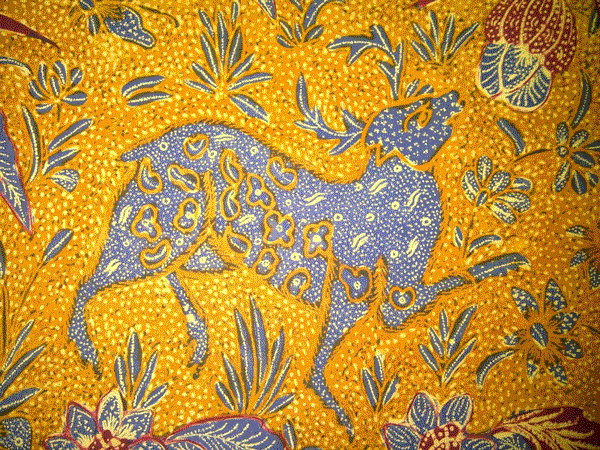 There are many types of Batik fabric in coastal areas, for example in the area of Pekalongan. Most of the patterns in the Netherlands including Batik patterns buketan. 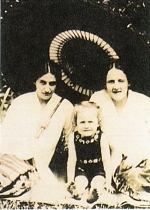 One of them is the famous batik works of Eliza buketan Van Zuylen. On the development of batik, batik Netherlands Eliza van Zuylen is recognized as a top copyright batik works of Netherlands. Because batik Eliza van Zuylen offers the highest level of complexity both in terms of the typical motif and detail, as well as in terms of colorful of the resulting color. Most of Van Zuylen Eliza-style batik buketan, to produce a colorful flower pattern on it Eliza buketan Van Zuylen by using synthetic color substances so that the resulting colour is more diverse. While the tinting process is also done by painting and dipped for a time in machining process efficiency. Eliza van Zuylen also perform various development patterns, for instance by combine his buketan style with elements of Chinese culture, since at that time already began to appear also in Arabic and Chinese batik in Java. Chinese cultural elements are visible on the emerging pattern of lilies, peacocks and detail isen-isen is more complicated on the buketan design. The colors shown on the hand becomes more diverse and bright, still using synthetic dyes. Carolina Josephine van Franquemont is Netherlands women were touted as the first Netherlands citizens established a batik factory in Indonesia. In the hands of Caroline-lah, stands a batik factory in Surabaya in 1840 that would later become part of the history of the development of batik in Indonesia, particularly the coastal batik. Caroline, who eventually migrated from Surabaya to Semarang, bringing the influence of bright batik patterns, dynamic, and more life into the batik pattern. 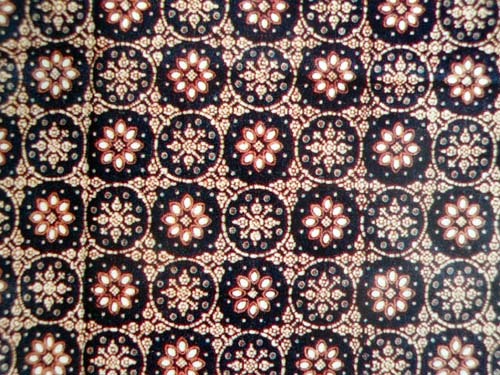 The pattern of coastal batik is very different compared to the style of the Kraton Jogjakarta and Solo batik. Coastal Batik is considered more “recalcitrant” for daring to display bright colors and lights up, much different when compared batik keraton coaster and tend to rely on ground colors. As the people of Europe that has not forgotten its cultural, Caroline poured a traditional European stories into his hand. 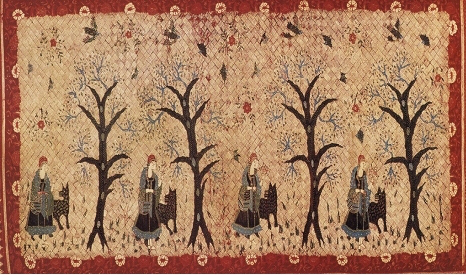 Call it Hanzel and Gretel or Red Riding Hood, two of the many monumental works of Caroline. 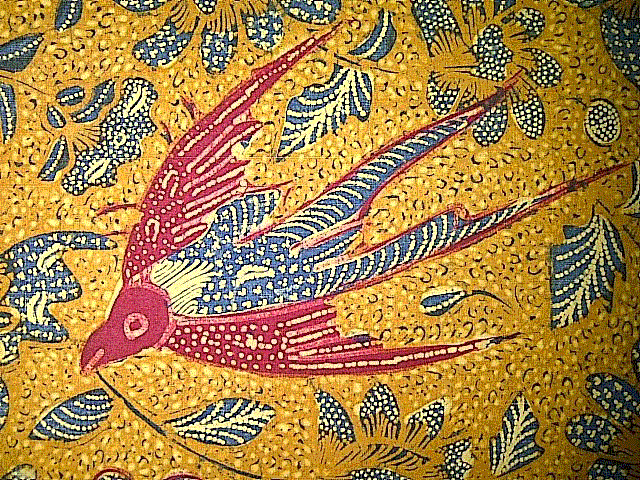 Belanda batik or Dutch batik emerged and developed between 1840 and 1940, almost always in the form of a sarong and initially made only for the Indo-Dutch, Dutch and Eurasians, and in the coastal region (Pekalongan) mainly. Most Dutch batik displays the combination of a bouquet of flowers, or a flowering tree, birds, especially herons, geese, and small birds, and butterflies. This type of combination has also been made with Chinese or Javanese ornamentation. Dutch batik colors have always been clear, according to the European taste. The drawings were presented clearly, ranging from flowers and animals to airplanes, buildings and human forms. There were drawings with themes inspired by tales European, such as Red Riding Hood, snow white, and Hansel and Gretel and even the goddess Hsi Wang Mu, a design influenced by Chinese culture, the puppet, a puppet and shadow circus design. 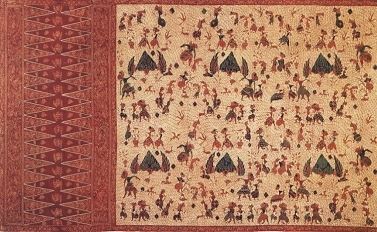 The environment, also, had an impact on domestic product Dutch batik: batik of the Court saga – Brown continued to be the choice of the main color. The natural environment that encompassed the atmosphere of the Court imbued with a batik Interior shade Dutch court, thus. Dutch Batik is more attractive in appearance, because – as with the Dutch coastal batik its high level of refinement, retail, harmony. The porters, who were originally limited to the Dutch environment, then expanded to include Chinese and Javanese aristocracy. History of Oey Soe Tjoen begins in Pekalongan in 1925. Oey young. With Jade Nio Tjoen Kwee, his wife, he pioneered the batik. His house in Jalan Raya Kedungwuni, Pekalongan, as place of business. According to the third generation of Widianti Oey Soe Tjoen “production process can be up to one and a half years,” he said. 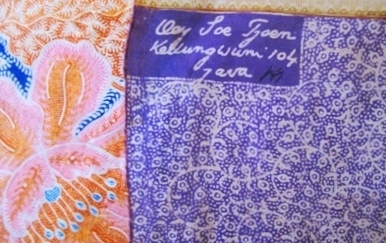 “Price is equal to the price of one.” With the long process of making batik production, Oey Soe Tjoen hard was encouraged. Moreover, the number of workers was not as much as it used to be. Now they can make at most two pieces of cloth a year. 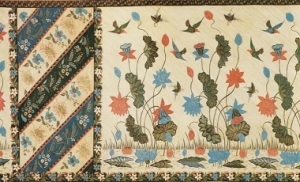 The famous batik motif design is the motif of buketan-influenced style of the Netherlands Batik, the Peacock Butterfly, motif and Java batik Hokokai style. The main Motif is famous for its tint to seem very much alive. Whereas to display such motives, the effect requires workmanship for up to 3 times the sticking of the night. Isen-isennya Motif is very dense and smooth. Imagine drawing with pen rotring numbered 0.1 and it cant used by pembatikan Oey Soe Tjoen size with it. The first is a batik from first Batik generation i.e. Oey Soe Tjoen (grandfather of Widianti) who batik factory founded it with his wife Kwee Tjoen Jade Nio that debuted from 1925-1976. The two Batik from the era of the 2nd generation i.e. Oey Kam Long, son of the couple (the father of Widianti Widjaja) and his mother Lie Tjien Nio in 1976-2002. Although using the name Oey Soe Tjoen, actually a division of tasks in running the batik process is as follows: the husband is the task in terms of sales and staining (immersion), Wife is duty: design motifs and quality checks. All of which is now done by Widianti Widjaja. How to Dyeing Batik fabric? There are three kinds of batik : handwritten, stamp and handprinting. It is “ngrengsi” making pattern and design on material. It is drawn using a pencil. Draw using a wax and canting – small dipper used to apply wax in batik process- it is made by following the pattern drawn with a pencil on the both side –back to back-. “nyolet” is painting with brush or canvas for the need of certain color on the area wanted. It is made by following the pattern drawn by a pencil. Cover any uncolored parts with a wax. It has an intention to avoid a color mixing for the next coloring/ngerek. 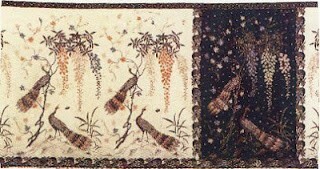 After dipping, it is dried in the sun, and let it dry. Then, repeat the previous process/the second step, next, it is “nglorot” omit wax from the material by putting on vessel and using hot water, boiling in a high temperature. After clean from wax, let it dry and back to previous process -covering using a wax in order to withstand the first and second color- Wax open and close process can be made repeatedly in accordance to the number of color and complexity of design wanted. The last process is clean the material using clean water, and dry in the sun before wearing. Making a pattern/design wanted on white material. It was made by stamping. Don’t forget to dip it first into hot wax which put on vessel and press it on material. First color process. Dip material -which free from wax- into certain color. Dry in the sun and let it dry. Then, back to batik process-draw using wax and canting to cover the first color- it is forbidden to use a stamp when making color covering process. Keep on dipping to make the second color. Then, omit the wax from the material by putting on a fair place with hot water. After cleaning and drying, back to batik process: keep the first and second color using wax and canting. The opening and closing process can be done repeatedly based on the number of color and the complexity of design wanted. Wash batik, dry in the sun, let it dry before wearing. First coloring process, started by making a pattern/design wanted on white material using silk-screening. Keep on repeating to create the second color as well as to create batik combination. Dry under the sun light or put it in special oven. Usually, leave it for 2-3 days so that the drug can absorb in material. There are two options: steam using a vapor on a high temperature or use a chemical, water glass. It has a purpose to stick and keep the color on material and to avoid discolored.